I love BarryM nail varnishes, they're definitely my favourite brand that i've found out on the High Street and i was really looking forward to trying the Gelly Hi Shine range. I won this nail varnish in a giveaway, so was a great treat to be able to use on my nails. It's a lovely dark pink shade, it looks a bit red, but it's definitely a reddy pink. I really like the shade, i think it's perfect for this season, and looks great with the majority of pieces of clothing. I only applied one coat, and that's all it really needed, which is great as opposed to having to wait to apply a second coat, but with this luckily you don't need to. 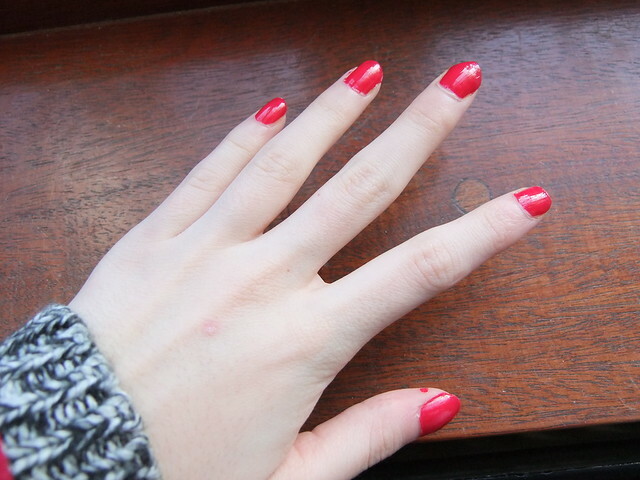 The nail varnish doesn't chip easily, and lasts a long while. I'm writing this review 5 days after having the nail varnish on, and only now is it just beginning to chip, so with just the one coat, it does last a long while. The packaging is simple, a glass square bottle, with the logo and brand written on the front. It's like all other BarryM packaging just what's written on the front is different. Aww I have this, it's one of my favourites! Can't beat red for nails in my opinion! I absolutely love this colour, great for spring! This looks like such a nice bright nail polish! Love the shade!